Host a Screening — A.B.L.E. The magic of the movies - A.B.L.E. style! So often when we see individuals with disabilities on screen, the focus is on them somehow needing to "overcome" their disability, or succeeding despite their disability. A.B.L.E.’s films are not like that. We imagine worlds where they can pursue jobs and meaningful relationships as naturally as they race cars and fly jetpacks. Our hope is these films will spark meaningful dialogue and encourage audiences to celebrate the differences in all of us. Both of our feature films were written especially for the ensemble by A.B.L.E. co-founder and teaching artist, Lawrence Kern, based on monologues and scenes they devised. Actors collaborated with professional filmmakers to create a unique spin on classic cinematic genres. We are happy to arrange private screenings at your local cinema, school, or community center. Depending on location, we can also arrange talkbacks with some of our cast and crew. How many people do you anticipate will attend? Who is your target audience? What type of space will the screening be in (auditorium, movie theatre, conference room, other)? Would you also be interested in a talkback with the cast and crew? Thank you for your interest in hosting a screening of one of our feature films. Someone should reply within 48 hours. If you have additional questions, please e-mail Lawrence. 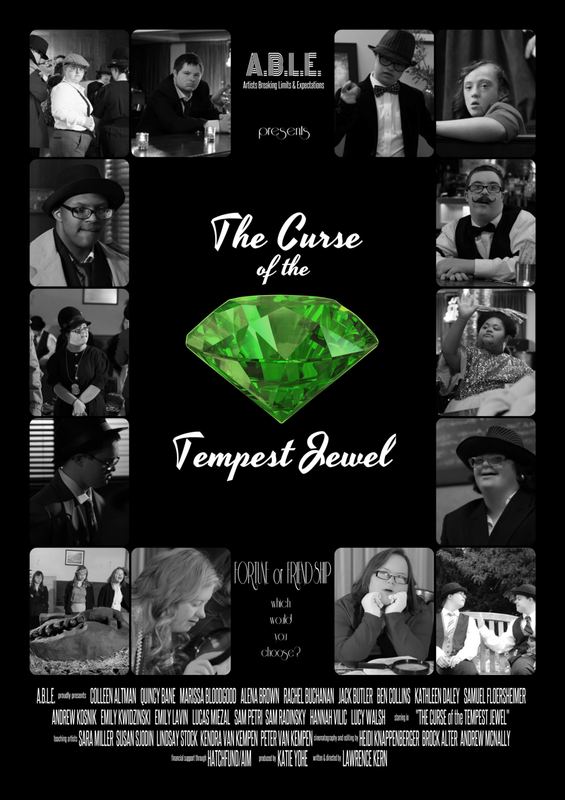 This film noir follows an ensemble cast of 17 actors with Down syndrome as they embark on a quest for the legendary Tempest Jewel, which was lost at sea 200 years earlier. A wealthy client commissions two local detectives to track down the treasure with nothing but a cryptic riddle for guidance. As they interview people around Chicago, each new character daydreams about what he/she would do with the fortune. They must ultimately face the difficult choice between fortune and friendship. A riff on the classic spy-adventure genre epitomized by James Bond, THE SPY WHO KNEW ME follows super spy Tabitha Link and the ladies of the all-female agency U.N.I.T.E. After receiving an anonymous tip, Tabitha winds up at the scene of a jewelry heist where she sees a face from her past. She and her fellow spies race to find the connections between a series of thefts, a top-secret military experiment, and several missing operatives before they lose themselves completely to the evil organization E.C.H.O.